Congratulations to Kingfisher Tours our latest tourism operator to be awarded ECO Certification at the Ecotourism level as well as ROC certification. Kingfisher Tours is a proudly locally owned and operated scenic flight specialist located in Kununurra. Their range of tours are designed to showcase the very best of Australia’s spectacular landscape, history and cultural heritage. Explore the world famous Bungle Bungles as well as some other unique highlights along the way. Lake Argyle, the Argyle Diamond Mine, Cockburn Ranges, Wyndham and the Cambridge Gulf are all showcased making these flights a most spectacular and memorable experience. Coastal flights that offer a truly panoramic experience of our rugged north, with its mighty river systems, majestic waterfalls and stunning coastline and beaches. Ground tours are included at Kalumburu community and Mitchell Plateau airfield along with refreshments. To find out more about Kingfisher Tours visit their website here. Congratulations Leadbeater Eco Tours – Ecotourism certified! Leadbeater Eco Tours is named after Victoria’s endangered faunal emblem, the Leadbeater’s Possum. The specialise in friendly eco tours to the Dandenong Ranges and Yarra Valley. Tours include pick-ups, lunch, a dedicated guide and guaranteed small group sizes. * giving back and contributing to local programs that are a positive for the regions they operate in (for example tree planting days). To find out more about Leadbeater Eco Tours visit their website here. Congratulations to Bike About who have achieved Advanced Ecotourism certification for their Mountain Biking & Cycle Touring Camps and Environmental Sustainability Camping trips. Bike About provides a service for schools (metro and regional), sporting clubs, youth groups, corporate groups, other outdoor adventure companies and the tourism industry. Camps focus on geography, bush walking, cycling education (on & off road), bike maintenance, bike equipment and hire, adventure tourism and physical fitness. To find out more about Bike About Tours visit their website here. Two of Ecotourism Australia’s leading operators, Capricorn Caves (Rockhampton, Queensland) and Rawnsley Park (Hawker, South Australia) have recently joined the EA Geotourism Forum. The main purpose of the Geotourism Forum is to advise how best geotourism can be promoted and to further Ecotourism Australia’s interest in inspiring environmentally sustainable and culturally responsible tourism. The Forum Steering Committee comprises Ecotourism Australia members with extensive experience in geotourism. The Chairman is Angus M Robinson, Managing Partner, Leisure Solutions®. He is supported by Dan Cove, Manager at Jenolan Caves; Ross Dowling, Foundation Professor of Tourism, Edith Cowan University; Rod Hillman, Chief Executive, Ecotourism Australia; Bruce Leaver, Chairman, Sapphire Coast Tourism; Rick Murray, Director, Nitmiluk Tours; and Dr Young Ng, Chairman of the Association for Geoconservation, Hong Kong. Ann Augusteyn, Capricorn Caves and Julie Smith, Rawnsley Park are welcome additions to the Forum Steering Committee, contributing their experiences and knowledge to fostering Geotourism in Australia’s most awe-inspiring natural places. Ecotourism Australia’s Advanced Ecotourism certified operator, Taronga Conservation Society Australia have recently launched their world first smartphone app, ‘Wildlife Witness’. Developed in partnership with TRAFFIC, the app allows users to directly report illegal wildlife trade by taking a photo, pinning the exact location of the incident and sending the details to TRAFFIC. These reports will be analysed by a Wildlife Crime Data Analyst and credible incidents will be referred to enforcement agencies for action. Over time, this information will help build international intelligence about illegal wildlife trade, prioritise response action and highlight areas in need of increased enforcement resources. “Illegal wildlife trade is worth at least $19 billion annually and is threatening the future of wildlife all over the world. Today alone, 100 elephants will be killed and 12,000 bears are sitting in cages as part of the worldwide demand for wildlife products,” said Cameron. Taronga Zoo’s male Sun Bear, Mr Hobbs, was rescued as a cub from outside a Cambodian restaurant when an Australian traveller reported the incident to authorities. He was destined to be sold for bear paw soup. We love to see our certified operators receiving glowing reviews in mainstream media. If you have a great news story and are a Ecotourism Australia certified operator – please share it with us! 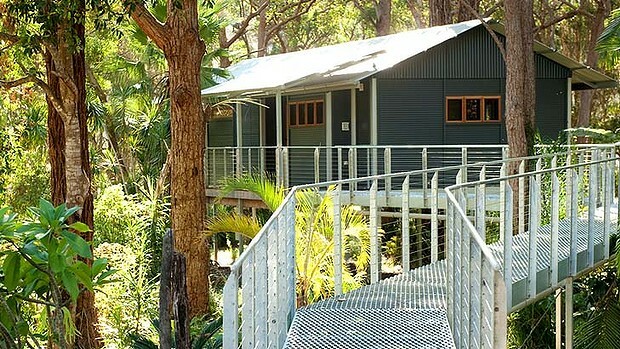 Diamond Waters Treehouse Retreat provides for two luxury environmentally sustainable ‘treehouses’ built high among the trees and overlooking wetlands and the Camden Haven River. The property is surrounded by national parks and some of the best beaches and waterways on the east coast of Australia. Diamond Waters Treehouse Retreat is both Advanced Ecotourism and Climate Action Business certified. The owners aim to provide guests with an experience that is stylish yet sustainable. To read the full review in the Sydney Morning Herald Travellers Section, click here. To find out more about Ecotourism Australia’s certification programs, click here.